Golden Hawks across Canada and beyond are making plans to fly home and share good times with old friends at Homecoming 2018: Legend of the Hawks. This year's Homecoming celebrations – taking place Sept. 22 in Brantford and Sept. 28 to 30 in Waterloo – include something for everyone. Among Brantford highlights are an exclusive sneak peek of the new Laurier-YMCA athletic and recreation complex, a barbecue and an evening alumni reception. In Waterloo, a weekend of events includes the Golden Hawks taking on the Guelph Gryphons in the annual Homecoming football game, alumni parties at The Turret and Wilf's, a pancake breakfast and many other on-campus events. Alumni in Calgary and Ottawa can gather together to watch the Sept. 29 Homecoming game at official pub parties organized by the alumni office. So get set to proudly wear your purple and gold. We'll see you at Homecoming 2018! 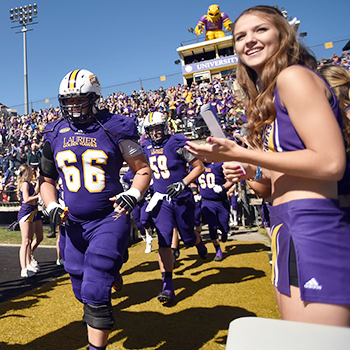 Video: Experience Homecoming at Laurier.